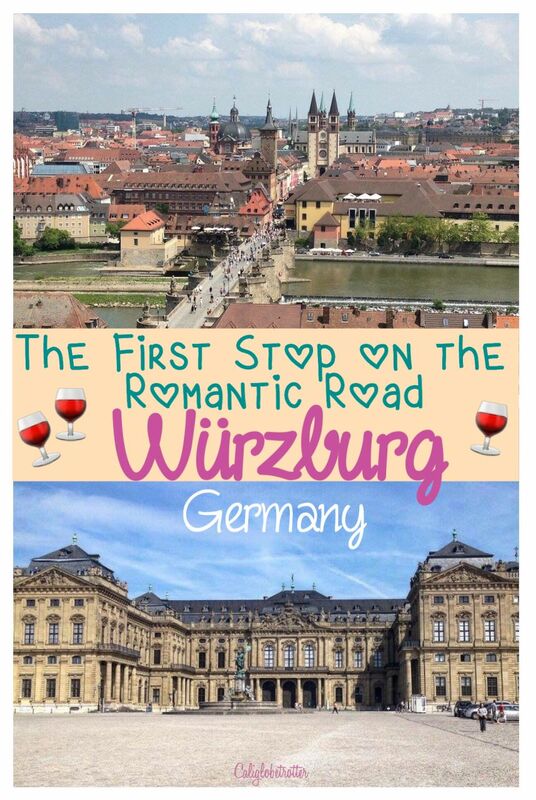 Würzburg is another town that is a part of Germany’s Romantic Road which leads from Würzburg to Füssen, which includes Rothenburg ob der Tauber. These are all some of the most beautiful cities in Bavaria, and each equally romantic. The beautiful thing about Würzburg is that it is one of the major wine regions in Bavaria. Therefore, there is always a wine festival to find. The two times we have been, we found ourselves drinking our way through town with wine! The most popular here is the Franconian wine! Immediately, I was put off about the city just from the train station. Don’t be put off by the fact that the Main Train Station isn’t very nice looking and under some construction. But as soon as you head out the door, you just follow the crowd into the city center. Würzburg was practically 90% destroyed during World War II in 17 minutes, but thankfully it has been completely rebuilt from the ground up by the women of the town. You can still see signs of the reconstruction of the city, but now it is a mixture of modern and old buildings. Our first port of call was checking out the Dom St. Kilian and the Neumunster Kirche, both of which were very beautiful. St, Kilian is Germany’s fourth largest Romanisque church and was built in 1045-1188. On our first time there, we happened to be there during their Volksfest, so there were people everywhere watching the parade. We watched some of the parade before deciding to go inside and check out the Neumunster Kirche before everyone else decided to go in at once the parade was over. It is tradition though for many towns, that on the opening day of their Volksfest, it begins with a small parade by the town and local breweries to carry in the first barrels of beer into the festival. The parade continues until they have reached the festival grounds. After the parade has reached the festival grounds, the drinking debauchery can officially commence! Further on down the road, you eventually run into the Altes Rathaus (Old City Hall) before walking further to reach the main bridge. It was built in the 13th century and over time different stages were added as over time it was extended in the 15th and 16th century. Directly behind the Altes Rathaus, you will head towards the Old Main Bridge. At the very beginning of the bridge is a good place to stop and have a glass of wine and enjoy the scenery. It’s easy to find as everyone will be standing around on the bridge drinking a glass of wine. It’s so nice to be able to walk around in public with alcohol. It makes it more enjoyable to enjoy a glass of wine with an amazing view instead of four walls. Behind you lays the view of the city center and ahead of you lays the Festung Marienburg (Fortress) up on the hill with the river Main flowing beneath you. After stopping for a quick glass of wine, we hiked up the hill to check out the fortress. The hike is a bit steep so be prepared! Luckily, there are a few platforms to take a break which offer the best views over the entire city and the river. Once up at the top, we only walked around the fortress. There was a restaurant and a café as well. The first church was built in AD 707 and by 1201, it was extended into the fortress it is today and was the residence of the prince-bishops until 1719. Today, the fortress is just a museum which houses important artifacts from the 1,200 year history of Würzburg. Once back down into the city, we found our way to the Würzburg Residenz. First we thought that we would enjoy a bottle of wine at the Wine festival and then go into the Residenz. Well that did not happen! We drank too long (oops!) and ran out of time to check out the amazing staircase inside, so I would later go back with a friend who also wanted to see the inside. The Residenz was built between 1720 and 1744 and suffered serious damage during the war but has now been completely reconstructed in its original form. The Residenz was the home of Prince Bishops. The second time I went to the Würzburg Residenz, my friend and I checked out the amazing staircase inside. The ceiling of the staircase is the masterpiece of the entire Residenz because it was the a constructional achievement at that time to be rounded and shaped in a long rectangle. Each corner of the ceiling is painted with a different continent: Asia, Europe, Africa and lastly America. Each continent is represented by a typical landscape and animals and a female allegorical figure. Europe holds a scepter, is symbolized by a bull, and has a boy playing with a cannon. America has natives with feathers, who practice cannibalism of prisoners, and a crocodile. The symbolism of America is depicted as uncivilized during the age of Reason, even though the artist who painted it had never been to the Americas. Asia has a tiger. Africans have an elk, and a caravan of turbaned Magi. Some of the animals painted in the frescos are painted as the painter thought they might have looked without ever having seen the animals. If you love wine, then visiting Würzburg is a good choice! It is a popular wine region and you can always find a wine festival somewhere in town! I believe there are at least 14 wine festival just in the summer! ?? When we went back the second time, we hit up the Wurzburg Wine Village that had over a hundred different wines to try at all the different village huts set up throughout the town. It was so beautiful so see how the different wine tents just surrounded the Marienkapelle and throughout the main square. It was so nice to have a wine festival for once instead of always just beer. We hopped drank our way around from one tent to the next and tried several good wines and the more wine I drank, the less pictures I took. Have you been to one of Wurzburg’s wine festivals yet? How was it? For more information about Wurzburg’s Wine Festivals! Be sure to check out these other festivals!